Arps Dairy is seeking the input from individuals in the community to determine which new product we bring to market next! We heard you say how much you favor our French Onion Chip Dip, and we’ve heard the repeated requests to expand our dip line with new flavors… so that is exactly what we are doing! The new product selection process started with ten different full-flavor options that were crafted. Our internal team of taste testers was able to whittle the ten options down to two, but that is where things got tough. Our internal votes of the two were essentially tied – split right down the middle. At that point it was obvious that we needed a tie breaker so we are asking you, the members of our community and loyal patrons, to cast your vote and decide which option you want to see on store shelves. The two options are a cucumber and southwest style spread. The cucumber based spread can be used as a dip for chips and veggies, a bagel spread, or smeared on crackers and pretzels for a creamy and refreshing snack. The southwest spread offers a range of pepper spices that also go very well on veggies, but it can also be spread on a burger or sandwich for a unique, flavorful lunch or dinner, used as a sour cream substitute on a taco, or it could be lunch by itself with some chips. Samples of each new product will be given away at the Defiance County Fair in Hicksville, Ohio August 19 – 26 from 5:00PM – 7:00PM. 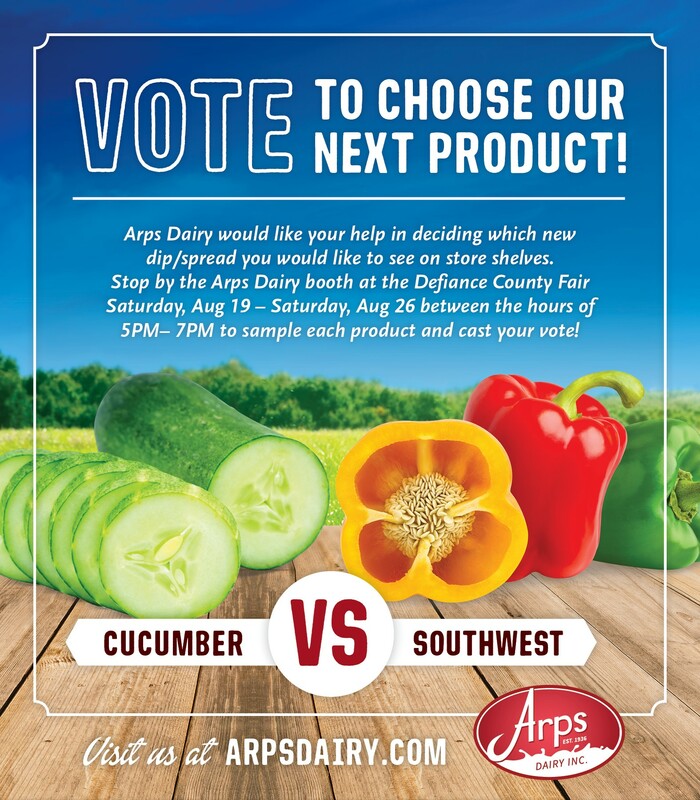 The Arps Dairy vendor exhibit will be located in the Outdoor Ag Exhibit area near the livestock barn and the sausage stand, so stop on by to try each new option and cast your vote for the product you would like to see come to market!